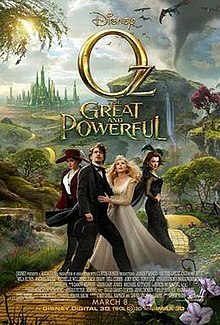 Oz the Great and Powerful is a prequel to The Wizard of Oz that tells the story of how the Wizard became the Wizard. Some people may expect the story be more like the story from Wicked - the musical and the book it is based on. Other than the setting and focusing on things that happen before Dorothy ends up in Oz, the two tell different stories tied to the same characters and location. I have read Wicked and I have the musical soundtrack, so I do know a bit about that version. Oscar Diggs works as a magician - stage name of Oz - in a traveling carnival. Oz tends to chase after anything in a skirt, which leads to him fleeing the carnival in a hot air balloon. He flies right into a tornado that takes him to Oz. He meets Theodora, a beautiful young witch who believes that Oz is the wizard everyone in Oz has been waiting for to defeat the Wicked Witch. Oz has to decide what he is going to do, though he can't seem to stop himself from chasing women, which causes even more complications. The movie was released in 2D and 3D. I saw the 2D version. I did not some images that had the potential to look cool in 3D. The graphics are done well, making the locations in Oz look gorgeous. The beginning of the movie, when Oscar is still in Kansas, is in black and white, like the original movie, and it only turns to color once he arrives in Oz. The story is interesting and entertaining, connecting to things from the original movie as well as things from the book that were left out of that movie - like the village where everyone is made of China. In addition to showing how the Wizard comes to power, the rise of the Wicked Witch is also covered. Something with that is a little predictable, though children or people who haven't seen the original movie may find that more surprising. The story makes sense. Things are resolved while also leaving some things open for possible sequels. This is a good family friendly movie, though a few scenes could be scary to younger children. The flying monkeys are now vicious flying baboons that are freaky. The characters work and the casting is good overall. Oscar is hard to like since he is a bit of a jerk. I really enjoyed Oz the Great and Powerful. It is entertaining overall and worth checking out. I did pick up the movie on blu-ray/DVD. I believe there are several extras, but I haven't taken the time to check them out yet. I did post a longer review at Epinions after seeing the movie in the theater. Got this this weekend and agree it is a very good film. There were bits in the beginning that I didn't enjoy/follow but as the film progressed the characters grew and the story got to be quite entertaining. I liked that too..how it started in BW and then switched to color in Oz.